They file down the corridors of this soaring hotel clad in matching pink t-shirts and carrying identical pink backpacks, an electric magenta army marching to the beat of bicycle racing. The herd enters a conference room where chattering voices quickly hush. Edward Hult, the company’s North American CEO and son of founder Bertil Hult, climbs aboard a stage to deliver an update on the team’s progress. Hugh Carthy sits in third place overall, just 22 seconds out of the lead. There’s one stage to go, a pan-flat circuit race through the streets of Denver. Carthy can still win this thing, Hult says emphatically. Carthy’s result is not Hult’s most impressive update, however. In the team competition—yes, the often overlooked “Team GC” prize—EF now sits in second place overall. The squad’s collaborative effort has advanced them into this lofty position, which is an important lesson on the power of teamwork, he says. Hult’s speech represents an important cornerstone of EF’s strange new status as the latest savior of American cycling. It’s been a year since the company inked an eleventh-hour deal to save America’s longest-running WorldTour squad from extinction. The deal marked perhaps the most pivotal moment in the history of the team that, over the years, has been known for its various cycling-specific sponsors, Cannondale, Garmin, and Cervelo, among others. The deal also launched this Boston-based study abroad company and its 46,000 global employees headfirst into the tumultuous business of pro cycling. EF is one of American cycling’s largest benefactors, spending between $8 to $10 million each year on the team. Now, the company and its cycling team face a common challenge: how do you make a multi-million dollar pro cycling operation a worthwhile component of a global study abroad company? The answer may rest with EF’s employees, and their collective desire to become fans of the sport and the team. There are early signs that it is working. For two weeks last August the riders and staff within the Slipstream Sports anxiously awaited their collective fate. On August 26 team CEO Jonathan Vaughters revealed that the squad faced a $7 million shortfall, the result, Vaughters said, of a potential sponsor axing a deal at the last minute. Vaugthers launched a very public cry for help, and officials maintained a hopeful attitude that a last-minute sponsorship deal or crowdfunding campaign could save the organization. Riders and staff knew that the news was likely a kiss of death for the team. On September 9 the worrying ended. An employee with EF Education First had seen the team’s crowdfunding campaign and alerted the company’s executives. After a series of phone calls, Vaughters traveled to Boston and struck a deal with company chairman, Phillip Hult (brother of Edward Hult). This was no ordinary sponsorship agreement—EF purchased the team outright from Vaughters and his co-owner Doug Ellis, who served as the team’s financial backstop since its inception in 2004. Financial terms of the deal were not disclosed. EF became sole owner of the team, and responsible for its annual budget, which hovers between $15 million to $17 million each year. The company committed to back the team for at least three years. The unorthodox deal raised eyebrows within North America’s cycling community. The market for title sponsorship is historically bad—many of the largest teams are fronted by a bicycle company. Why would a global company focused on study abroad programs, language immersion, and other travel-centric education plans buy a professional cycling team? Edward Hult declined to speak for this story, however VeloNews spoke with nearly a dozen EF staffers to better understand the deal. The picture that emerged was of a global company that for years had struggled to find the right advertising opportunity. EF Education First is more than 50 years old, with offices and schools in more than 50 countries worldwide. Yet the company’s success had, prior to 2018, relied almost entirely on word-of-mouth and specific marketing toward teachers and schools. The company wanted to market itself to the masses, in North America and overseas. It wanted average Americans to recognize its electric pink “EF” logo. That meant EF needed to get on television and in mainstream media. And EF wanted to accomplish these goals on a limited budget, which eliminated many mainstream advertising opportunities. And EF had a completely separate corporate desire: it wanted a new way to entertain its own employees. In 1998 EF sponsored a boat in the Round the World Race, the global yachting competition now called the Volvo Ocean Race. For months, EF employees followed the progress of the company’s yacht. When it docked at international ports, EF brought its employees out to meet the crew. A decade after the sponsorship ended, employees still raved about the yacht competition. Could the company find a branding opportunity that was equally as entertaining? For years EF investigated various advertising opportunities, always shooting down the options. American sports lacked the international component; international sports were too expensive. TV ads cost a fortune and provided little internal excitement. And then, one day, a cycling team on the brink of financial ruin fell into the company’s lap. Steffens, who now manages the team’s budget and business development, was operating EF’s Educational Tours division at the time of the acquisition. He said the deal was highly unusual—he had never seen anything like it during his time with the company. Slipstream’s financial crisis was one of several scares during the team’s 14-year history. After the 2011 season the team nearly disbanded after its then bike sponsor, Cervelo, went through a rocky acquisition. From 2007 until mid 2008 the team operated without a title deal after its original sponsor, TIAA-CREF, did not renew for a fourth year. The 2017 crisis was different. So worried was Vaughters that he assembled his CV and reached out to professional contacts seeking career advice. The sponsorship failure put dozens of jobs at risk, not just his. The stress was overwhelming, he said. Behind the scenes, Vaughters said he was often pulled in too many directions at once, which limited his effectiveness as Slipstream’s leader. With one of the smallest budgets in the WorldTour, Slipstream required its staffers to perform multiple jobs. Vaughters oversaw performance plans for the athletes. He also managed the budget and the team’s existing sponsorships, and the outreach to potential new sponsors, among other tasks. The deal with EF brought a level of financial security that Vaughters had never enjoyed. It also removed some of the tasks from Vaughters’s plate. EF took over the team’s North American travel and allocated a handful of staffers to help various tasks, from creating the team’s design and look, to managing its social media. It brought on a vice president of marketing to track the team’s media impressions. It even created a mascot for the team, a pink crocodile named Argyle. In January 2018 EF’s upper brass asked Steffens to take on management the team, to oversee the team’s finances and sponsorships. Steffens peeled back the team’s financial layers and saw a budget-conscious operation that cut costs at nearly every opportunity. The financial strategy meshed with EF’s vision for the team—adhering to the budget was more important than winning every race. 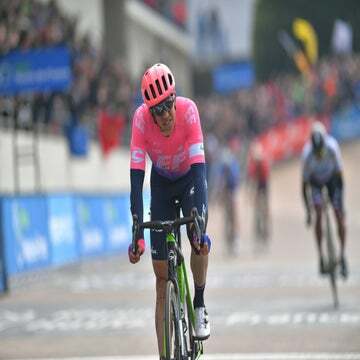 Rather than seize ownership of the team’s name, EF maintained sponsorship arrangements with longtime benefactor Drapac Capital Partners and bike sponsor Cannondale. The decision created one of the longest team names in the WorldTour, EF Education First-Drapac powered by Cannondale. It also preserved millions in sponsorship dollars for the team. Steffens also addressed the business challenges that EF faced with the team. The company’s marketing goals were fairly straightforward; the team’s WorldTour status guaranteed it entry to the Tour de France, the Amgen Tour of California, the Giro d’Italia, and other races with international television broadcast. The EF brand was sure to be splashed across television. But how to promote the team within the company? Unlike football or soccer, where the season builds toward a championship, cycling’s non-linear calendar poses a headache for novice fans. Why should employees care about EF’s results at smaller races like the Volta Catalunya or Gent-Wevelgem? Cycling’s complex rules and strategies posed a challenge for everyone to learn, Steffens included. As the peloton speeds by in a colorful blur, Ivan Perez, a Boston-based EF employee, stands alongside the course barriers in downtown Denver and cheers, waving a sign that says “Phinney For The Winney.” Perez, 24, is flanked on all sides by fellow EF employees, who are crammed into a 400-foot-long EF party zone, designed to look like a pink backyard barbecue. With every pass of the riders, the entire EF area erupts with cheers. Perez knew very little about cycling prior to this summer. Throughout the month of July EF promoted the team’s Tour de France ambitions to all 46,000 employees. Employees received two emails each day updating them on the team’s progress in the race. Included in the emails were daily video recaps done by Vaughters. A massive map of France was erected in the lobby of EF’s Boston headquarters; the map showed the race’s progress across the country. At all of the company’s global offices, managers were encouraged to hold viewing parties during the race. The three-week Tour de France promotion capped off EF’s months-long strategy to teach its employees about pro cycling. In the spring EF flew riders out to the Boston offices for a meet-and-greet with employees. Pro rider Alex Howes operated a bingo trivia night with cycling-centric trivia questions. The company raffled off signed jerseys and other memorabilia. The company also brought its employees to races. Hundreds attended the Amgen Tour of California, and others traveled to Rome for the finale of the Giro d’Italia. EF brought 450 employees, including 75 from the Boston offices, to the final stage of the Tour de France. After the race, EF even threw a congratulatory party in Houston for Craddock, whose struggle to complete the race with a broke scapula earned mainstream headlines. Has EF’s internal promotion of the team transformed its employees into lifelong fans? Perhaps. During interviews at the Colorado Classic, EF staffers consistently spoke positively about the cycling team, even if those employees revealed a cursory understanding of the sport. Most interviewees did not know, for example, that the team has struggled to collect WorldTour victories in recent years, or that it has never won the country’s biggest race, the Amgen Tour of California. For now, access to the heroic riders, and the company’s Tour de France promotions are far more important than results. That may change, of course, as EF’s employees become more acquainted with the sport. As he pours himself a beer at the EF tent, Hector Lopez, a custodian in the Boston offices, recounts his favorite moments from the Tour de France. 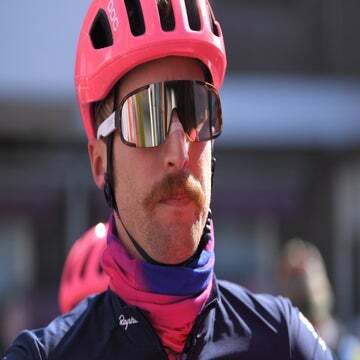 Lopez had never followed cycling prior to 2018, and found himself drawn into the race due to his company’s attachment to the team. 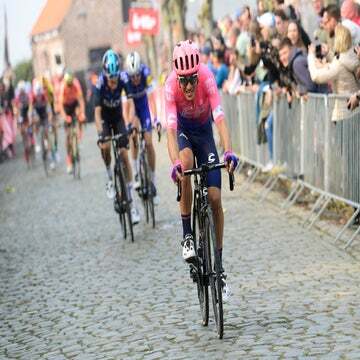 And then, on the ninth stage, Lopez watched in dismay as team leader Rigoberto Uran crashed and fell out of contention.